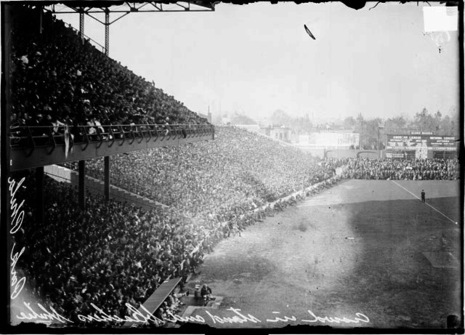 The 1910 World Series featured the Philadelphia Athletics and the Chicago Cubs, with the Athletics winning in five games to earn their first championship. Jack Coombs of Philadelphia won three games and Eddie Collins supplied timely hitting. The greatest Cubs team in history closed out its glory years, only ten years into the new century. 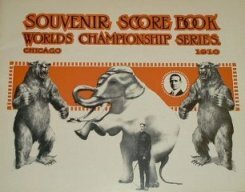 The first decade of World Series baseball came to a close as two regulars, the Chicago Cubs (making their fourth appearance) and Philadelphia Athletics (making their second) went head-to-head for the championship title. 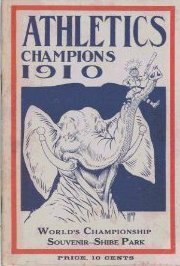 Both teams were powerhouses with the A's chalking one-hundred two victories and winning their pennant by fourteen games. The A's boasted three .300 hitters with Eddie Collins, Rube Oldring and Danny Murphy and a thirty-one game winner in Jack Coombs, a twenty-seven year-old righthander who was 12-12 the previous season. Both teams suffered devastating injures and would not be at full strength for the Series. The Cubs had lost second baseman Johnny Evers to a broken ankle and Philadelphia was missing Oldring with a broken leg and pitcher Eddie Plank who was suffering from an arm ailment. Although A's manager Connie Mack was handicapped with the loss of one of his starting pitchers, he remained confident in his other aces Jack Coombs and Chief Bender. Bender, coming off his first twenty victory season in the Major Leagues (he was 23-5), opposed the Cubs' Orval Overall in Game 1 of the Series. The matchup proved a mismatch, with Bender pitching a one-hitter into the ninth inning and Overall departing after allowing three runs and six hits in the first three innings. The A's, getting three hits and two RBIs from Frank Baker, scored a 4-1 victory as Bender completed a three-hitter with eight strikeouts. In Game 2, Coombs maintained his team's momentum with a solid, but unspectacular Series leading performance. Although he lasted a complete game, he surrendered eight hits and nine walks while managing a 9-3 victory. Philadelphia had consecutively beaten two of Chicago's top aces and prepared to tee off on a third against Series veteran, Ed Reulbach. The A's came out swinging in Game 3 and drove Reulbach off of the mound in the second inning after tallying three runs. Harry McIntire took over in the third with a 3-3 tie, but was shelled for four runs in the 1/3 inning. The Cubs continued to collapse and before the inning was over, the A's had tacked or a fifth run en route to a 12-5 romp. Coombs remained unbeatable while pitching with only one day of rest. Playing well on both sides of the plate, he only gave up six hits and had three hits and three runs batted in. Suddenly, the mighty Chicago Cubs, considered sports first official dynasty, found themselves on the brink of elimination. Realizing that Philadelphia's advantage was the direct result of poor pitching, the Cubs put their faith into the right arm of rookie Leonard (King) Cole, who had just completed a 20-4 season. The twenty-four year-old newcomer handled the pressure well, but was pulled in the eighth inning, while trailing 3-2. Hanging on by a thread, Chicago managed to get something started in the ninth when playing Manager Frank Chance tripled home Frank Schulte. Then, in the tenth, Chicago's Jimmy Sheckard came through with a two-out, game-winning single against Bender, who had gone the distance, but paid for it with a 4-3 loss.